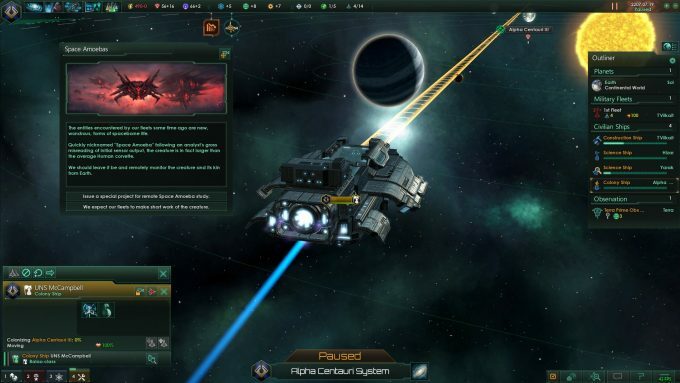 Stellaris is a brand-new sci-fi 4X strategy game made by the folks at Paradox. The company is best-known for its period games like Europa IV and Crusader Kings 2, so does it have what it takes to bring us boldly into the future of space exploration? Or is it doomed to reside in oblivion at the center of a black hole? The past few years has given us a resurgence of space-based video games. It hit its pinnacle of popularity in the 90’s, but it wasn’t because gamers were desperate for them: it was because developers had so little to work with in every way. A cockpit with a few enemies was much easier to bring to life than an FPS game could ever hope to be at the time. It was then that the 3D graphics revolution began and games like Quake and Unreal let loose the FPS beast, leaving space-based video games behind. After 2011, several classic game makers resurfaced and went back to their roots by building new space games. We now have more options at our finger tips than ever before, and finding true classics are becoming much harder today. 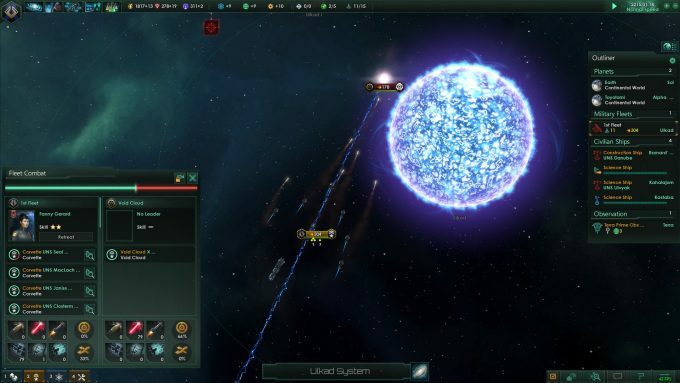 Stellaris is another newcomer to the space genre, but how does it set its self apart? Let’s begin that question with: what is Stellaris? Simply, it is a 4X space strategy game that plays in real-time, but you can pause at any point to manage almost every aspect of your empire. While this isn’t breaking the mold of what defines the genre it is in, it’s the details that really make this game shine brighter than others of its kind. Starting a new game will show you a few preset races, but, that’s just the tip of the iceberg. If you desire, you can customize your empire from the ground up. The species tab lets you choose between either Mammalian, Reptilian, Avian, Arthropoid, Molluscoid, or Fungoid. You can then customize your choice’s appearance further with no less than 14 or more individual races for each of those species types! That’s the real strength of this game: choice. 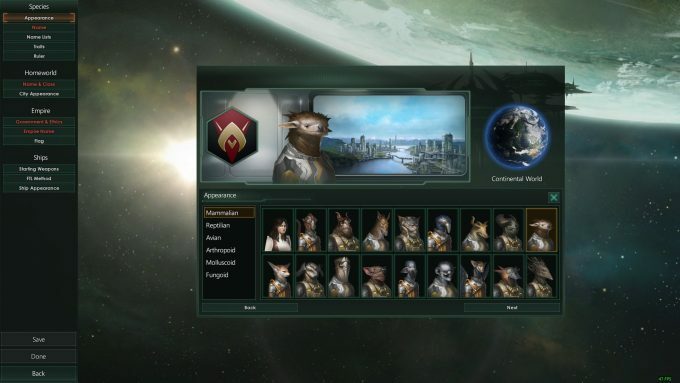 With Stellaris, you can lose a lot of time customizing your empire from almost every single detail you can imagine and with many options to choose from. Many 4X games generally have only one way to travel between the stars, but in Stellaris, there are three, and all of them have pros and cons. To many of you, this may seem trivial, but think about it: if you use one mode of travel that requires you to build a gate at two points for instantaneous transport, how slowly will your empire grow because of it? 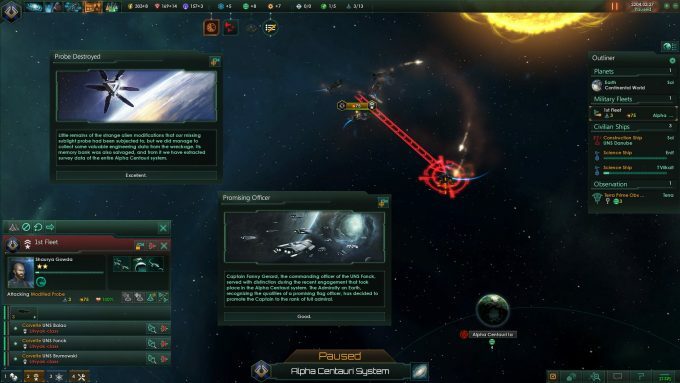 These kind of decisions may seem trivial at first glance, but Stellaris pushes you to think about the long-term game before it has even started at all. Not surprisingly, stepping into the game for the first time can be overwhelming. Thankfully, the tutorial isn’t one or two pieces of useful information that then kicks you to the curb. Rather, it interacts with you by bringing up information to the window you are on so you have the right information at the right place at the right time. Sadly, the voiceover only reads as far as one paragraph, so you need to read the rest on your own. When the voiceover did finish its spiel, it left me thinking that there was more information to be gained, and there was no prompt to tell me to read on, which was a minor annoyance. A detail that many developers overlook is the UI. The UI can make or break a 4X game just as much as the game play. I’ve been infuriated with other 4X games because the only way to get a planet’s production window had been hidden behind several other menus and sub-menus. Therefore, I spent more time in the menus hunting these things down rather than simply clicking on the planet of where I wanted to build something. Fortunately, this game’s UI is intuitive, functional and interactive at almost every level. If you think you can click on something or move a window, you probably can – and that is very liberating. The element that binds these things to work well is the game play. Though for a 4X game, that covers many different facets. I’ll begin with AI because it is the linchpin from which everything connects to. No game should let an AI cheat because the AI needs to be challenging; it can be challenging in other ways, like with the aforementioned race customization, and precursor races. The precursor races are those who have reached the pinnacle of the game’s technology but don’t care to expand into space any further. This keeps the infant AI races at more of an even pace with your development, and you can loathe or love the fact there is always a bigger threat out there. There is still the option to adjust the difficulty, but it isn’t a requirement for the game to be a challenge. The AI must also serve you in combat and administrate your rule over a vast territory. When I watched my first battle, the AI surprised me by having my forces spread out and then attacked. This simple yet efficient tactic prevented a bottleneck when my ships were attempting to evade later on in the battle. Then it diligently kept its prey in firing range while executing the evasive maneuvers, even with almost 20 ships in the mix at one point. There have been too many times I’ve been at the mercy of losing ships due to poor AI combat, but, every single engagement here felt balanced and optimized as much as it could be, even if I lost several ships. This is the price of war, but no one should pay for it if the AI is stupid, which it isn’t here. 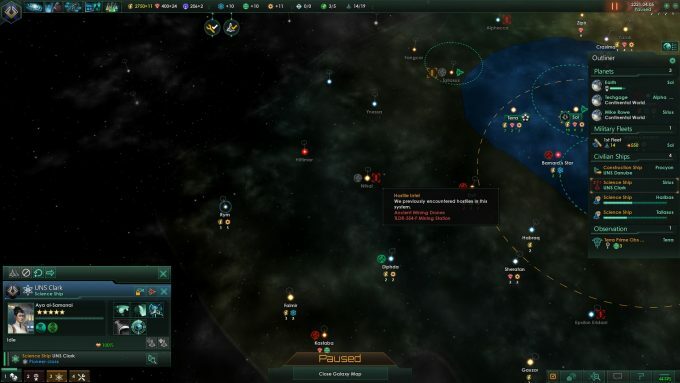 In Stellaris, an AI will never be perfect when it comes to administrating all the rules you want your empire to follow. How the game sets this up is you have a sector and you leave it to the AI; you can only control a maximum of 5 worlds, and then it follows a preset of rules for that sector. Honestly, this did not sit well with me, so I did what any self-respecting PC gamer would do if they had the option: I modded the game. This then let me control more planets than what were available to me on the whole map, so sure, this slows me down, but it illustrates how flexible the game engine can be. From day one the developer, Paradox, has supported mods on Steam’s Workshop, and the community has responded positively with an abundance of options. The next mod I installed resized the research window so that it wasn’t as tiny as it once was. I then added some music, as well as some races from other games like Star Trek, Warhammer and Mass Effect. I then added more options to the empire creator with more colors, flag symbols and banner backgrounds. There is literally no limit to what you can change so if you find something you don’t care for, like I did, just mod it out. At this point, I had probably put 16 or more hours into Stellaris, and that’s just my first game – but something strange had happened. I had lost almost all track of time up to this point. This is due to how the game keeps you so engaged so early on in the game. You’re the head of the empire, so there are many things you get involved with, like colonization, research, food, resource production and on, on it goes. Then something out of the blue happens that triggers new events, stories, missions, encounters, treasure hunts and etc; it feels unexpected and is greatly appreciated. For instance, you have a science ship survey a gas giant, and it finds an anomaly. So, you need to look at it closer. You do and you either find a ship, or your science ship blows up. Things just go bad sometimes. Or, you find ruins that has you embark on a scavenger hunt to find more clues to its mysterious message. These events are captivating for sure, but they lose their luster mid to late game. Not because they get boring, but because it becomes more difficult to find new and interesting things when every race is spreading out. The only thing left to do at this point is for you to make your actions worthwhile, be it interacting with the other races out there, building powerful ships, earning a victory condition, and etc. This is the biggest issue facing Stellaris and the developer knows that, but, it’s planning to bring more content in future updates. Paradox hasn’t said if it will be paid for or free content, but Paradox has been known to release content at a reduced price for quite some time now. This is yet another reason why I’m enthusiastic the game provides so much support for mods. Users can introduce content in the interim by way of these mods, bolstering what’s offered right from the get-go (much like how Skyrim‘s release went down). Stellaris does not sport very hefty system requirements, but if you were planning on playing this on a dual-core CPU PC: you can’t. At minimum, the game requires a quad-core CPU or better, but the graphics card requirement isn’t as hefty; something in the past 4 years will do nicely. Unfortunately, this also means the visuals are very limited in what you can change, but this is a small price to pay especially when you consider that the game looks magnificent. The game does support multi-monitor resolutions, but everything is stretched and out of proportion in many ways. I suspect ultra-wide users will suffer from the same thing but to much a lesser degree. The game’s music has been beautifully crafted to draw you into the majesty of how epic this game is when you look out at the galaxy for the first time. I would seriously recommend that anyone who buys this game get a version that includes this games soundtrack – you will not be disappointed in it. That being said, the only shortcoming is, again, the brief voice acting. There just isn’t enough, which is a shame because what there is, is great. A technical limitation that many 4X veterans might find bothersome is the limited save capacity. There are only about 45 slots, give or take, that you can use, and then you have to manually manage which ones to remove, which takes time away from the game. While this amount sounds like a lot, the saves do add up quickly when you consider a medium size map of 600 stars can play on for 100 hours or more. There are ways around this limitation, but you need to make sure that you don’t save your games to the cloud if you do use them; it will get even more cumbersome to manage and you might lose a few files along the way. So, let’s talk about what OS you can play this on: the answer is Windows, Mac and Linux – even SteamOS! Linux and Windows share similar system requirements but the Mac platform needs a little more power. This agnostic approach also means you can play a multiplayer game with your buddy who likes his Mac, but if you prefer SteamOS, you can still play against him. 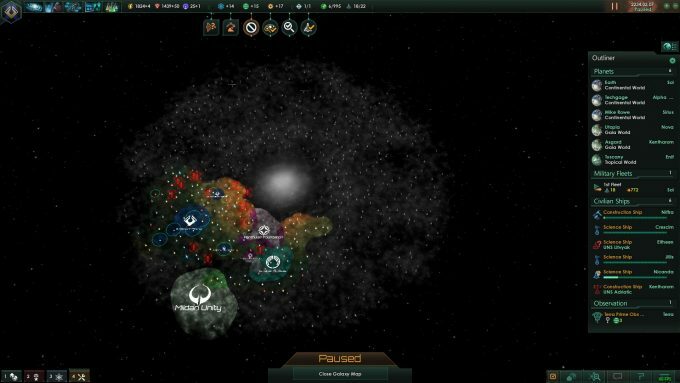 In the end; Stellaris offers a unique, interesting and rich 4x experience, at first. Unfortunately, the mid to late game momentum becomes stagnant so it might not hold as much interest as it once did in the beginning. Thankfully, the developer is addressing these shortcomings with new content coming out later this year. Therefore, this game is easy to recommend if you don’t mind being patient for not only the length of each game, but also the future content. Limited voice over for the tutorial. Mid to late game lacking content.